Evaluate your phone voice. If your organization records calls, ask to listen to one of your own. If not, record yourself talking to a friend. Many cellphones have recording devices these days, or you can use any recording device you have access to. Listen objectively to your own voice. Do you sound nervous or overexcited? Do you sound rushed or indifferent? Identify the elements of the call that you can control and change, starting with your voice volume, pitch and tone. Read body language during face-to-face encounters, and respond accordingly. Is the customer leaning on the service counter, drumming his or her fingers, and repeatedly checking the clock? Then he or she is likely in a hurry, so respond with speedy service. A hesitant customer who seems confused or worried will require more of your time, so patiently offer plenty of information and reassurance. Make a great impression on paper. Some customers still prefer to send handwritten messages through the mail and may expect you to respond the same way. Use your organization’s standard form letters to communicate through the mail, but add a personal touch. For example, use blue ink to sign the letter, as opposed to attaching your electronic signature and printing it from your computer. And add a handwritten P.S. inviting the person to contact you via phone or email for follow-up information. Use email to exceed customers’ expectations. Answer email messages within 24 hours. If you need longer to research a question, send a brief message acknowledging the customer’s query, and offer a reasonable time frame for delivering the answer. Personalize the email transaction by giving your name and, if possible, another way to contact you, such as a phone number. Avoid the temptation to use fancy backgrounds, colored type and elaborate fonts. “Speak” clearly on the Web. You may encounter a wide range of customers if you participate in your organization’s customer service chats. Some may be hesitant Internet users while others are confident Web surfers. Play it safe: Use standard English instead of the abbreviations commonly used in Internet chats and instant messaging. BRB may mean “be right back” to you, but it could confuse customers. 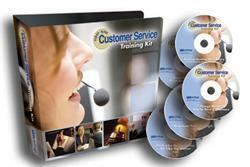 Source: First-Rate Customer Service Training Kit, WorkplaceTrainingCenter.com. View service situations from customers’ viewpoints. Act in the best interest of the organization to please customers. Avoid phrases that irk customers and damage your organization’s reputation. Handle the most difficult customers with confidence. Turn service situations into greater sales. This resource includes more than a dozen guidelines that show customer service reps step by step how to handle the most challenging situations they will encounter. They will learn how to assess each situation and quickly adapt their responses. The result: reps who shine in every service interaction. Click here to receive First-Rate Customer Service Forum once a month, delivered straight to your inbox! This entry was posted in First-Rate Customer Service Forum and tagged Communication, Customer service, Email, training. Bookmark the permalink.